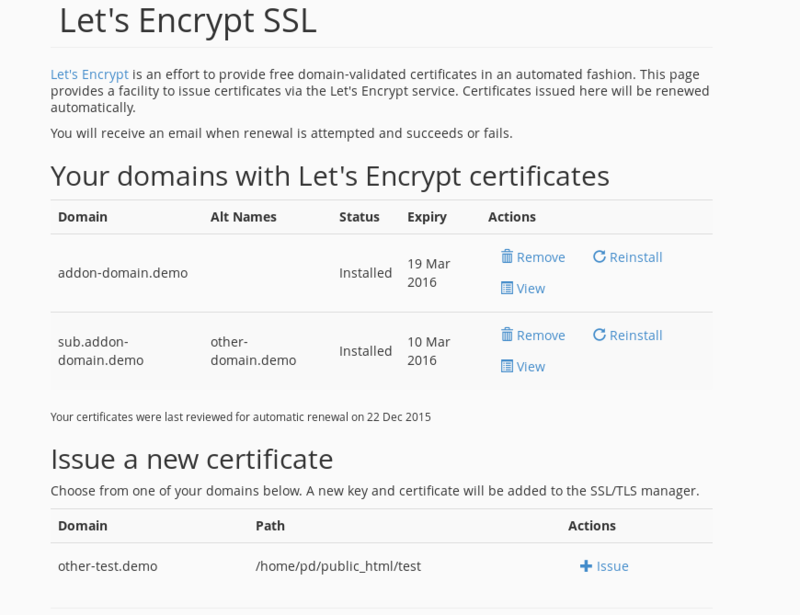 FleetSSL cPanel (formerly Let's Encrypt for cPanel) is a cPanel/WHM plugin for the Let's Encrypt™ service, which provides your end-users with the ability to instantly issue free trusted SSL certificates (including wildcards) for all of their hosted domains. From zero to certificate fully installed in around ~12 seconds. Automatic renewal in the background. Fully-featured 72-hour trial available for a single server. Latest release v0.15.0: HTTP API for end-users & dry-runs for testing certificate issuance. Development sponsored and hosting kindly provided by Serversaurus. Need a fast Australian host with excellent support? Single-server and unlimited licenses are available, check pricing for further information, or check out the docs for a technical overview or to get started.